… but do you really want to bet that a return to “sanity” is imminent? IRS gets audited (you read that right)… America’s freeloader allies… bashing taxpayers because of where they live… and more! “Right now is NOT the time to pick a top,” says a note from Alan Knuckman, our trading specialist at the Chicago Board Options Exchange. As a new week opens, the Dow and the S&P are down slightly, the Nasdaq up slightly. All are at or within a hair’s breadth of their record closing highs reached this month. You don’t have to look hard around the internet to find “experts” saying the top is in. Some of them sound reasonable, pointing out the stock market is expensive by historical standards. Others are screaming IMMINENT CRASH ALERT — complete with the all-caps and red font. Some of the latter have been saying so ever since the market began setting all-time highs in the spring of 2013. But the reality — uncovered by Agora Financial’s own research a while back — shows the S&P 500 spends roughly half of its trading days at an all-time high… or within 5% of it. A variant on the “top is in” theme came in recent days, when the S&P 500 broke a record for the longest stretch without a 3% pullback. The S&P has now gone 246 trading days — nearly a full year — without even a modest 3% climb-down. But the previous record of 241 days was set in 1995 and the first few days of 1996. That stretch marked not the end of a bull market that began in 1982… but rather the start of the bull market’s final mania stage, climaxing in the dot-com bubble. The S&P 500 climbed from 600 in early 1996 to well over 1,400 in early 2000. That’s a climb of 145% in four years. It might seem counter-intuitive, but a market like this — setting record after record — can be a challenging environment for short-term traders. “The melt-up momentum,” Alan Knuckman says, “creates the desire to ‘pick a top’ and bet against the direction of the market. Traders have to make peace with the absurdity if they hope to rack up the big money — waiting patiently for evidence the market is rolling over. That’s been a recipe for trading success for decades… but now Alan has brought a new “secret weapon” into the mix — a patent-pending tool that detects unusual action in the options market just before big moves. This tool serves up new trades every week… and every one of them plays out over just 10 trading days. “Stick a fork in the December Fed rate hike,” tweets Jim Rickards from Sydney this morning. The Commerce Department is out with “core PCE,” the Federal Reserve’s preferred measure of inflation. When the Fed talks about its 2% inflation target, this is the number it means. 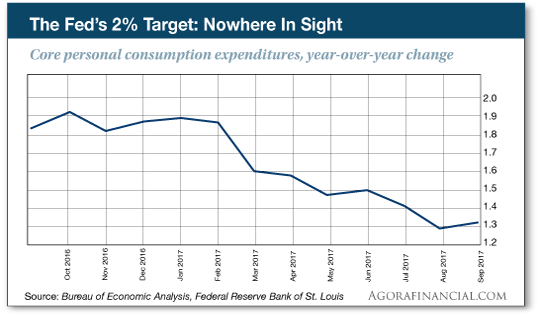 At 1.3% for September, the number has been flat or declining nine months in a row. Meanwhile, Americans spent out of an empty pocket during September, according to that same Commerce Department report. Personal incomes grew 0.4%… while consumer spending grew 1.0%, in part because people in Florida and Texas were replacing flooded-out cars. 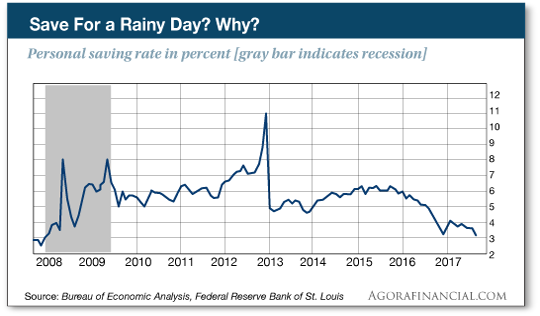 To be sure, the savings rate has been lower than this — it dipped below 2% at the peak of the housing bubble in 2005 — but numbers like these surely point to an increasingly stretched, if not stressed, American consumer. Indeed a falling savings rate puts the lie to the notion that consumer debt levels are nothing to worry about. It’s true that household debt, relative to income, is lower than it was 10 years ago just before disaster struck. But that just goes to show averages are deceiving. Nearly all the benefits have accrued to wealthier people. “Strikingly,” says a new report from Deutsche Bank, “all parts of the income distribution have seen their net worth-to-income ratio decrease except for the top 10%, indicating that the record-high net worth-to-income ratios… are driven primarily by the upper portion of the income distribution. Two points about this situation: First, it underscores the fact that the massive Federal Reserve money-printing of 2008–2014 has delivered the bulk of the benefit to people at the top of the economic pile. As the day wears on, the major U.S. stock indexes are all in the red — owing perhaps to the tax-cut rumor mill. Bloomberg reports that the much-ballyhooed corporate tax cut — from a 35% rate down to 20% — might be phased in over five years. Heh, so even the one certainty about the tax bill that we identified last week turns out to be a little uncertain. In any event… expect a lot more where this came from between now and Wednesday, when the House Ways and Means Committee is supposed to unveil an actual text of an actual bill. Between now and then, it’s all speculation. 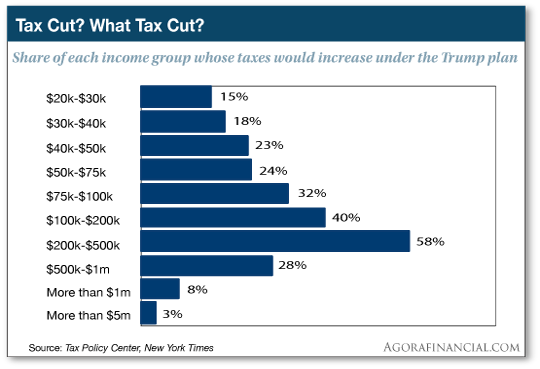 That said, we’ll be surprised if the vaunted “middle-class tax cut” benefits everyone in the middle class across the board. A few weeks ago, Sen. Rand Paul (R-Kentucky) made a splash with a tweet citing the Tax Policy Center saying nearly 30% of taxpayers with incomes between $50,000–150,000 a year would see their taxes go up. But that’s how it goes when the objective is not “tax cuts” but rather “tax reform” — aiming to keep a steady flow of dollars into Uncle Sam’s coffers. OK, we’ll try to hold our silence now until Wednesday once the plan comes out. The IRS got audited — how the tables turn — and a Treasury wonk uncovered a history of incompetence that leaves millions of us wide open to identity theft. Treasury Inspector J. Russell George testified before Congress about online security at the IRS. While one in three Americans now files his taxes online, the IRS has done nothing to safeguard Americans’ personal information. “George said the IRS has not fully implemented monitoring tools to prevent and detect computer hacks, is not monitoring its computer networks effectively for suspicious activity and operates outmoded computer systems,” says a recent article at Reason. The system the IRS uses is a 50-year-old dinosaur called the Individual Master File (very Big Brother-ish). The code is archaic, to say the least, and its replacement “has been plagued with delays and has no ‘scheduled or planned completion date,’” George said. Think for a moment about all the sensitive information on tax returns — Social Security numbers, bank accounts, income — and how they’d be open to hackers. Makes you all warm-n-fuzzy, huh? In light of privacy issues, George’s office also looked into IRS employment procedures and found the agency had rehired 2,000 employees in a 15-month period from Jan. 1, 2015, to March 31, 2016. Of those rehires, 200, or 10%, had been fired before — by the IRS — for infractions ranging from “conduct or performance issues, including several who had willfully failed to file their own taxes and four who were under investigation for unauthorized access to taxpayer information,” according to Reason. The IRS got touchy when questioned about their archaic system and irresponsible hiring. They claim it’s “cost prohibitive” to protect tax-paying Americans from crooks outside the agency… and inside. Why, of course. On the topic of the U.S. defense budget, a reader writes: “If it really were cut, as your Canadian reader suggests, how long before much of the world demanded we honor all of our decades-old treaties? The current occupant of the White House talked a good game on the campaign trail about how America’s “allies” should pick up more of their defense costs. But now that he’s in office, he’s threatening to launch preventive war against North Korea — a pipsqueak nation with an economy 1/80th the size of South Korea’s. South Korea spends 2.6% of GDP on defense, compared with 3.3% in the United States — according to World Bank figures. All we have to say is The National Taxpayers Union sure has gone downhill from the days four decades ago when Agora founder Bill Bonner was involved with the organization. The business about “84% of the benefits flow to those with incomes over $100,000” is the sort of tripe we’d expect from an envy-pimping lefty outfit. Of course the dollar amounts of the deductions are going to be higher at a higher income level. Meanwhile, the NTU begs the question of how far a $100k-plus salary goes in those high-tax states. For the most part, those high-tax states are also high-cost-of-living states. As for the “subsidizing blue states” argument, we’ve heard the same thing from readers now and then, and we just don’t get it. Why would you actively cheer on any change in the tax code that would impose a higher tax burden on your fellow citizens? Why would you pit one group of Americans against another in this way? P.S. Last chance: If you want access to the patent-pending tool that unlocks the potential for “seven-day fortunes,” you only have a few hours remaining. This presentation comes offline at midnight tonight.